I know I’m going to date myself when I say this, but the Smashing Pumpkins’ “Mellon Collie and the Infinite Sadness” is my favorite album of all time. Yes, I know it was released in 1995. Yes, I know that there are “better” albums out there (like the Beatles‘ “Sgt. Pepper’s,” of course), but it’s still my favorite. Wait: The Smashing Pumpkins are competing with the Beatles on eBay?! Before anyone proclaims sacrilege, we have to ask why the vinyl release of an album that’s just 15 years old is commanding such an impressive price. The U.K. version of "Mellon Collie" features three different labels on the discs, each in a different color. From a purely musical perspective, the vinyl version gives fanatics like me just a little bit more, with two songs not released on the CD version: “Tonite Reprise” (a tender, acoustic revisiting of “Tonight, Tonight”) and “Infinite Sadness” (an unusual instrumental track featuring sounds produced by a Mellotron, which was popularized in the late 1960s by the Moody Blues). On top of that, anyone interested enough in the Pumpkins to care about this vinyl release will be intrigued by the track listing, which is completely different from that on the CD. “Mellon Collie” is all about mood, about the swells of intensity and dynamics that are an integral part of the album’s overall listening experience. The fact that the vinyl version completely changes that progression is, in itself, enough to make me want to own it. Part of the motivation for the different track order is, naturally, the fact that the album must be divided into three records, or six sides. The CD version has only two discs: “Dawn to Dusk” and “Twilight to Starlight.” On vinyl, the album has six sides: “Dawn,” “Tea Time,” “Dusk,” “Twilight,” “Midnight,” and “Starlight.” “Tea Time” and “Midnight,” of course, immediately stand out as new additions. A 12-page booklet accompanies the limited-edition release. “Tea Time” ironically includes some of the album’s heaviest songs (“Jellybelly,” “Bodies,” “Porcelina,” and “Here Is No Why”), as does the aptly named “Midnight” (“Zero,” “X.Y.U.,” “Where Boys Fear to Tread,” and “An Ode to No One”). As these groupings suggest, songs appear at different moments in the album, to different effect. For the enthusiast, then, this vinyl version creates a revised concept of this album as a piece of art. More generally, though, the eBay auction begs a very important question—since when would anyone who loves the Smashing Pumpkins be interested in collecting vinyl? As far as DJs, audiophiles, and Baby Boomers are concerned, vinyl has never really gone away. But, more interestingly, it’s making an entrance with groups that never had a reason to own a turntable—it’s suddenly “cool” to own vinyl again. Teenagers and college kids—those arbiters of hip—are realizing, sometimes grudgingly, that maybe their parents were on to something. Just as vintage clothes have come back with a vengeance, so has vinyl, a vintage format for old and new sounds alike that many believe delivers a warmer sound than digital. Vinyl records are big and tangible, but also fragile and delicate. Their sound is considered more authentic, their hisses the key to their character. Analog is the new black. A vinyl copy of “Mellon Collie and the Infinite Sadness” certainly fetches a high price because it is rare. But the bigger reason for the vinyl rush in general may be that there are now enough young listeners and (dare I say it?) collectors out there who are realizing that the old-timey victim of the CD, which itself has been kicked to the curb by digital downloads, perhaps wasn’t so outdated in the first place. I look forward to reading more articles like this in the future. This my prized possesion on Vinyl (although not numbered), I found it at a really small record store in Leicester when I was at Uni there. Nice article. Whatever! Sgt Pepper is WAAAYYY over-rated. Mellon Collie is 10x better. 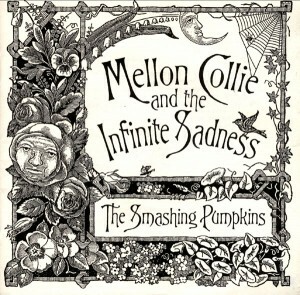 I’m dying to hear Mellon Collie on vinyl, for both the sound and the New (track) Order. Hopefully it will be reissued at some point. 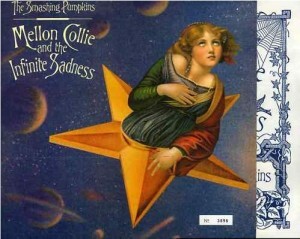 Do you know how many copies where originally pressed of Mellon Collie? The first pressing is numbered, but how many subsequent runs did they do? Also did it originally come shrink wrapped? Would be great if you could clear that up for me. Thank you.